Prosimian is an informal grouping of primates consisting of those belonging to the Primates suborder Strepsirrhini and the tarsiers of the suborder Haplorrhini. At one point, all prosimians comprised the taxon Prosimii, but this grouping was determined to be polyphyletic. Prosimians include the lemurs, lorises, galagos, and the aye-aye of Strepsirrhini and the tarsiers of Haplorrhini. Most prosimians are small, nocturnal, have a claw for grooming, and have a well-developed sense of smell. However, the members of the Strepsirrhini are characterized by a moist nose and eyes with a tapetum lucidum (shiny, reflective layer useful for night vision), whereas the tarsiers are part of the "dry-nosed" primates and lack a tapetum lucidum (despite being nocturnal). All strepsirrhines except the aye-ayes also have a toothcomb—a comblike projection of their incisors and canine teeth that is used for grooming—while the tarsiers lack a toothcomb. Prosimians are considered the most primitive extant primates, with characteristics similar to forms that were ancestral to monkeys, apes and humans. They are the only primates native to Madagascar, and are also found in Southeast Asia. Being nocturnal, the prosimians are less well-known than other primates, but are nonetheless important. They are integral to food chains, with various species being insectivorous (insects, crickets, grasshoppers, beetles), carnivorous (tarsiers are strictly carnivorous, consuming arthropods and small mammals), or consuming fruits, while being preyed upon by large cats, predatory birds, and so forth. Some of the fruit eaters are important for seed dispersal. For humans, their unique forms and for some species their explosive leaping, hopping, and running behaviors, add to the wonder of nature, whether seen in the zoo or the wild. The mammalian order Primates is divided informally into three main groupings: prosimians, monkeys of the New World, and monkeys and apes of the Old World. The prosimians are species whose bodies most closely resemble that of the early proto-primates. Early classification schemes broke the primate order into the suborders Prosimii (prosimians) and Anthropoidea (simians—monkeys and apes). However the prosimian tarsiers have been shown to be more closely related to the simians, and so tarseiers has been moved into the Anthropoidea, which is now renamed as Haplorrhini and Prosimii renamed as Strepsirrhini. Thus, present day taxonomies have the primates divided into the suborder Strepsirrhini, with all prosimians except the tarsiers, and suborder Haplorrhini, with the tarsiers, monkeys, and apes. Well-known extant prosimians include lemurs, the Aye-aye, bushbabies (galagos), and tarsiers. The adapids are an extinct grouping that were most certainly prosimians and closely related to the strepsirhines. The omomyids are another extinct group of prosimians but they are believed to be haplorrhines, closely related to the tarsiers, but an outgroup to the rest of the haplorrhines. Most species of prosimians are placed in the taxon Strepsirrhini, which is one of the two suborders of primates. One of the most distinguishing characteristic of these primates is their "wet noses." The name Strepsirrhini is derived from Greek meaning having a "curved or bent nose" (a terpsimbrotos compound of strepho or "bend" and rhis or "nose"). The wet nose refers to the rhinarium, which is the wet, naked surface around the nostrils of the nose, such as found in most mammals. Primates are phylogenetically divided into Strepsirrhini, or "curly-nosed" primates with rhinariums, and Haplorrhini, or "simple-nosed" primates that have a more mobile, continuous, dry upper lip instead of the rhinarium. Mammals with rhinariums tend to have a stronger sense of olfaction, and the loss of the rhinarium in the haplorrhine primates is related to their decreased reliance on olfaction, being associated with other derived characteristics such as a reduced number of turbinates. 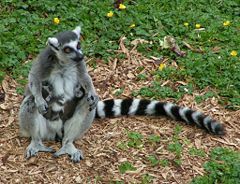 Madagascar's only primates (apart from humans) are strepsirrhines, although others can be found in southeast Asia and Africa. The suborder Strepsirrhini is composed of seven families and includes four families of creatures typically called lemurs, and three families with the lorises, pottos, galagos, and Aye-aye. Strepsirrhines are considered to have more primitive features and adaptations than their haplorrhine cousins. Their moist nose is connected to the upper lip, which is connected to the gum, giving them a limit to the facial expressions they can manage. Their brain to body ratio tends to be smaller, indicating a lower intelligence. Their brain's olfactory lobes are larger, lending to the notion that they have a stronger reliance on smell. Their snouts are generally elongated giving them a dog-like appearance, although this is true of some monkeys, too. Strepsirrhines also have a post-orbital bar, adding to the primitive nature when compared to the suborder Haplorrhini. The strepsirrhines have also retained the ability to enzymatically manufacture vitamin C, which has been lost by all the haplorrhines, including the tarsidae (Pollock and Mullin 1987). With the exception of the aye-aye, all strepsirrhines have a toothcomb—tightly clustered incisors and canine teeth—that is used for grooming. Another grooming adaptation is a claw on the second toe of all strepsirrhines, while the big toe is widely separated from the others allowing a vise-like grip for locomotion. About 75 percent of species are nocturnal and all of these have a tapetum, a shiny, reflective layer in the back of their eyes, although several diurnal species like the ring-tailed lemur have it as well. Many of the nocturnal species also have very sensitive hearing and ears they can move independently to capture sounds even better. The remaining group of prosimians, the tarsiers, belong to the suborder Haplorrhini, the "dry nosed" primates, along with the true simians (the monkeys and the apes). The name of this suborder derives from the Greek for "simple-nosed." Haplorrhines are considered to be less primitive than the strepsirrhine "wet-nosed" primates. The haplorrhines, including tarsiers, have all lost the function of the terminal enzyme that manufactures vitamin C (Pollock and Mullin 1987). The haplorrhine upper lip, which has replaced the ancestral rhinarium found in strepsirrhines, is not directly connected to their nose or gum, allowing a large range of facial expressions. Their brain to body ratio is significantly greater than the strepsirrhines, and their primary sense is vision. Unlike the strepsirhines, haplorrhines have a post-orbital plate. Most species are diurnal, with the exception of the tarsiers and the night monkeys, and they have trichromatic color vision. Their hands and feet are more generally adapted, with specialization only for locomotion. 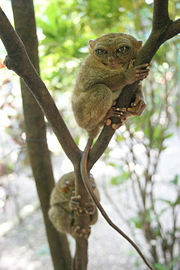 Tarsiers are those prosimians that comprise the haplorrhine infraorder Tarsiiformes, which has one extant family (Tarsiidae) and one extant genus (Tarsius). Although the group was once more widespread, all the species living today are found in the islands of Southeast Asia. Tarsiers are small animals with enormous eyes and very long hind limbs. Their feet have extremely elongated tarsus bones, from which the animals get their name. The head and body range from 10 to 15 centimeters in length, but the hind limbs are about twice this long (including the feet), and they also have a slender tail from 20 to 25 centimeters long. Their fingers are also elongated, with the third finger being about the same length as the upper arm. Most of the digits have nails, but the second and third toes of the hind feet bear claws instead, which are used for grooming. Tarsiers have very soft, velvety fur, which is generally buff, beige, or ochre in color (Niemitz 1984). All tarsier species are nocturnal in their habits, but like many nocturnal organisms some individuals may show more or less activity during the daytime. Unlike many nocturnal animals, however, tarsiers lack a light-reflecting area (tapetum lucidum) of the eye. They also have a fovea, atypical for nocturnal animals. The prosimians were once considered a suborder of Primates known as Prosimii (from the Greek pro, meaning "before," and simia, meaning "ape"). They have been shown, however, to be paraphyletic—that is, the smallest clade of related species that includes all of the prosimians also includes other species—in this case all of the primates. This relationship is shown by the ranks (prosimians in bold) in the list below of the current Primate classification between the order and family level. The classification known as prosimians is now used as a more informal or behavioral term nowadays, due to the lack of a unique last common ancestor. Smithsonian National Zoological Park (SNZP). 2008. Great apes and other primates: Differences among prosimians, monkeys and apes. Smithsonian National Zoological Park. Retrieved August 29, 2008. Niemitz, C. 1984. Tarsiers. Pages 338-339 in D. Macdonald, The Encyclopedia of Mammals. New York: Facts on File. ISBN 0871968711. Pollock, J. I., and R. J. Mullin. 1987. Vitamin C biosynthesis in prosimians: evidence for the anthropoid affinity of Tarsius. Am J Phys Anthropol 73(1): 65–70. PMID 3113259. Retrieved August 29, 2008. This page was last modified on 5 September 2008, at 19:48.